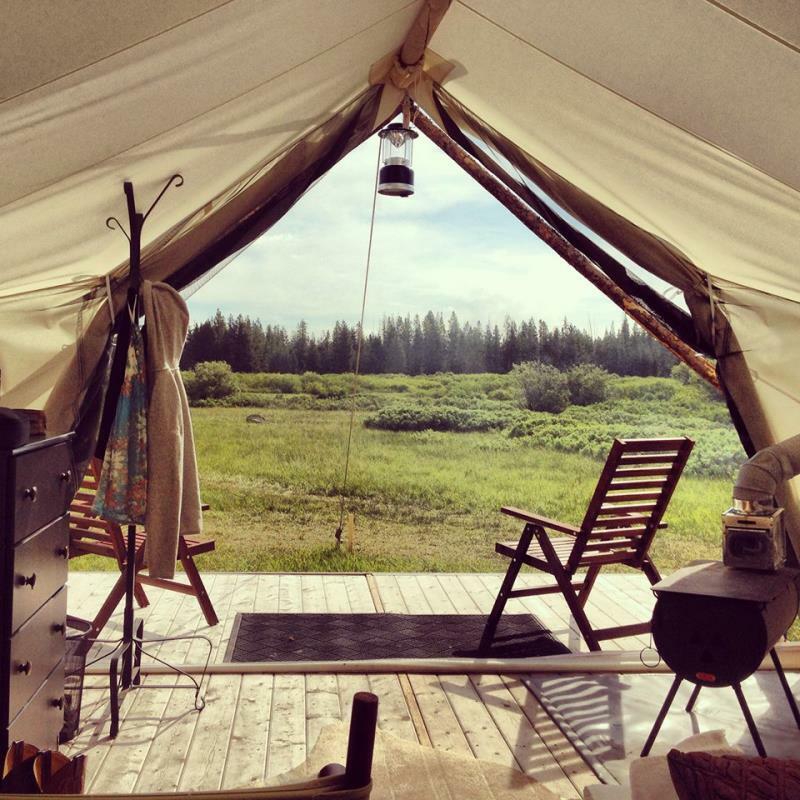 There’s something to this glamping (glamorous camping) craze that everyone is raving about. Imagine hearing the roar of a nearby river and feeling a cool breeze inside your canvas-walled tent while you’re snuggled deep in 400-thread count sheets in a stylish, well-appointed room. Glamping takes tent camping up several notches by providing everything a proper hotel would—from a real, full-sized bed plus clean bathrooms with running water and plush towels to some over-the-top amenities you would expect to find in a four-star hotel. Some glamping locations offer luxury like you’ve never experienced before with heated floors, separate sitting rooms, chandeliers, art hanging on the walls and luxury bath products… all in a clean, fancy tent! You don’t have to be Gwyneth Paltrow (who glamped and wrote about it for Goop) to experience the best glamping across America. Choose between 30 different luxury tents, set along the Black Foot River, to have an experience of a lifetime. The Resort at Paws Up sits on 37,000 acres of a working cattle ranch, and your family can even participate in a cattle drive. Guests can try their hand at fly-fishing, white-water rafting, horseback riding, ATV driving, archery and more. If you’re looking for the quintessential “Montana experience,” and you’re willing to pay top dollar for it, then this is the place for you. Plus, you might bump into a celeb. 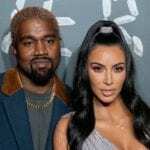 Prices range from $1,445 to $4,535 per night. Located about an hour south of Rapid City, and within the stunning Black Hills, Allen Ranch Campground has been family owned and operated for five generations. Guests here will dive into nature and cowboy culture through river tubing, nature watching, hiking, mountain-men-survival interpretive programs and large country suppers. 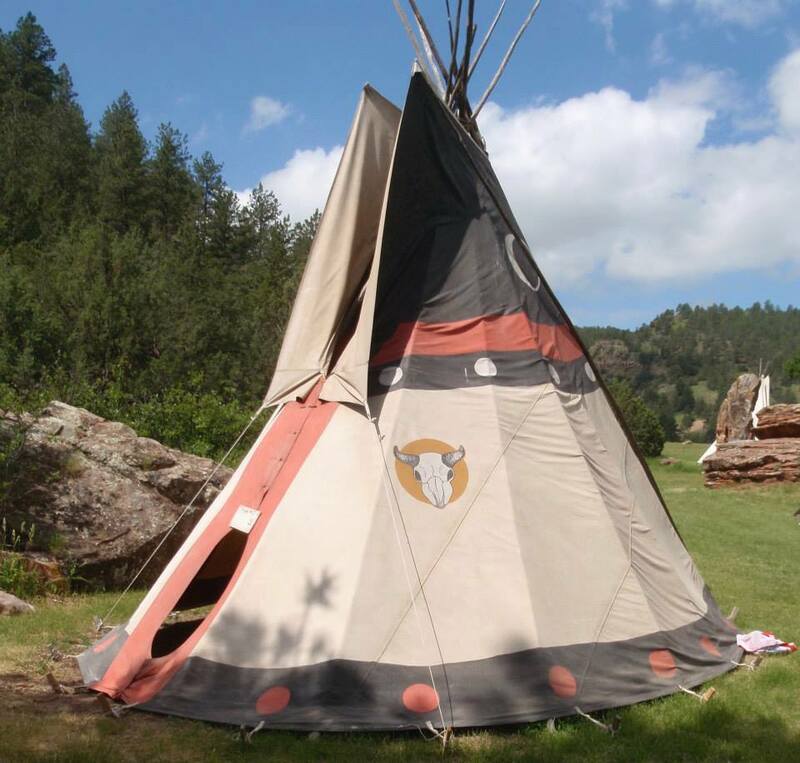 Not only can you stay in a glamping tent with beds and nice furniture, but also you can snooze in a Sioux Indian Tipi, perched along the “Minnekahta” (which means “the river of warm water”). Prices here are a more affordable $50 to $120 per night. If summer coastal breezes are your thing—and how can they not be?—then El Capitan Canyon is the place for you. 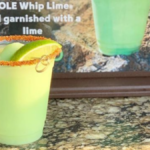 This southern California campground calls itself a “resort” due to their lavish amenities and indulgent offerings—there’s a market and deli onsite, guests can enjoy live concerts and performances and massages and yoga classes are available. “Luxury Campers” here can sleep in private cedar cabins, safari tents or yurts that all come furnished with designer willow beds and fluffy duvets, in thick wooded locations. Prices range from $225—$795 per night. To turn the spending dial in the other direction, take a look at an affordable and super accommodating option: KOA—Kampgrounds of America—nearly 500 KOA’s are sprinkled across the country, offering tent, RV and cabin camping options. To stick with the glamping theme, choose a Deluxe Cabin, which includes private bathrooms, kitchenettes, full sized beds with clean linens inside and grills, fire pits and access, in most cases, to a swimming pool, hot tub and family-friendly activities outside. 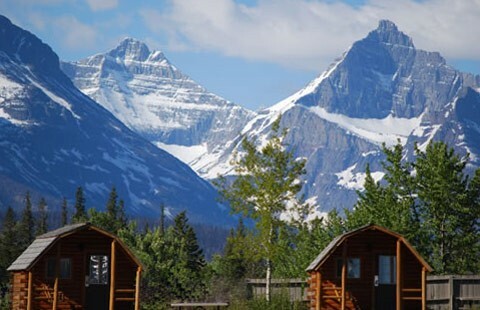 The West Glacier KOA and the St. Mary/East Glacier KOA are both near Glacier National Park and are fantastic options for families visiting northwest Montana. 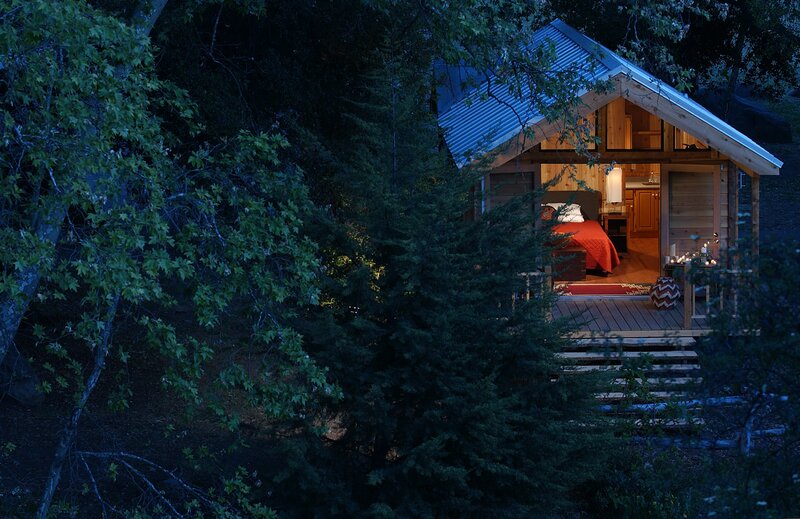 A Deluxe Cabin (with bathroom) is $340 per night. The National Park Service turns a whopping 100 this year. and what better way is there to celebrate than by visiting a national park? 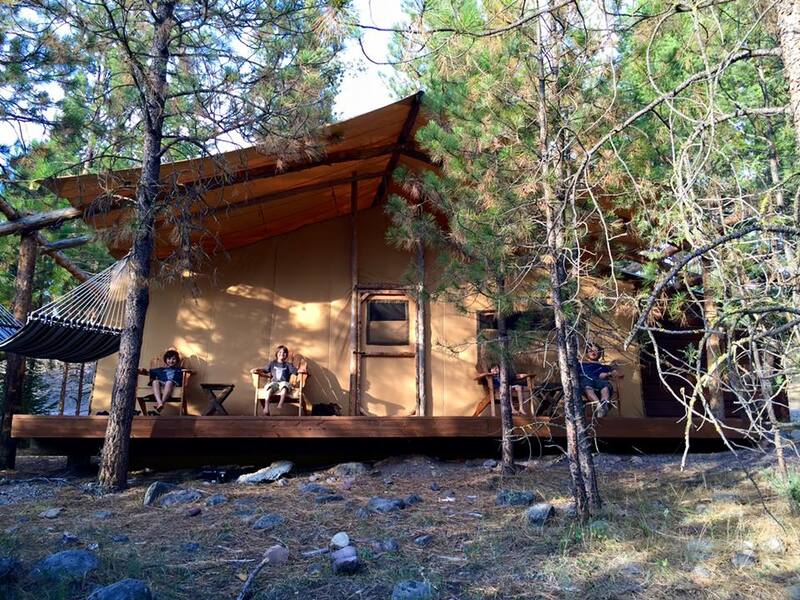 If you’re interested in venturing our west, check out the glamping experience either near Glacier National Park in beautiful northwest Montana or Yellowstone National Park in southwest Montana (or better yet: both!). 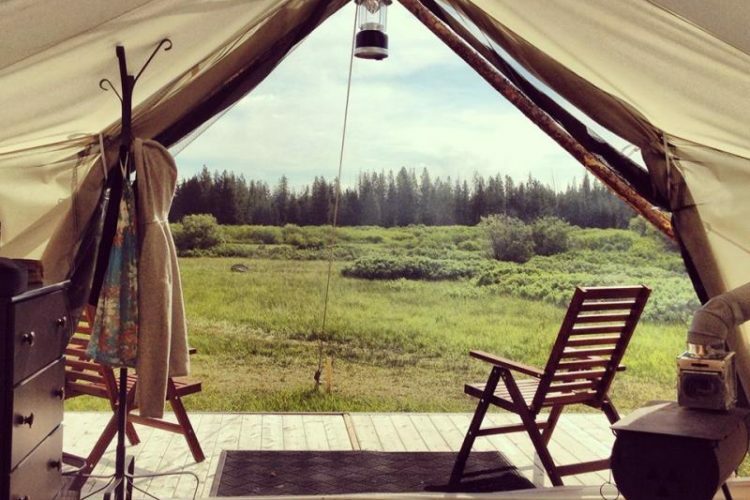 Glacier Under Canvas offers stays near the park, in luxury tents, for $168 and Yellowstone Under Canvas offers accommodations for $129 per night. Tipis can also be set up near the Safari Tents for kids in tow. All Safari Tents come with beds, furniture, linens, towels and a wood-burning stove (while there’s no electricity—lanterns, low lighting and a charging station are available). Glamping options do exist outside the West. Firelight Camps in Ithaca, New York, offers “nature meets luxury” tents in the beautiful Fingers Lakes region of the state. Perks included continental breakfast and daily happy hour offering craft beverages from around the region. 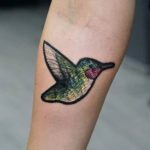 And Firelight Camps’ mission is one to get behind: Their aim is to create comfortable, stylish and revitalizing camping experiences that awaken staff and guests’ appreciation for nature, inspire adventure and deepen connection with family, friends and community. Tents start at $179 a night for double occupancy. 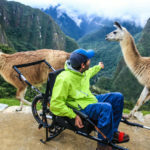 Check out Glamping Hub, an expertly curated online booking platform—they make it easy to book glamping vacations, all over the globe. Plus, you can search by the experience you want to have: treehouse, safari tent, yurt, tipi, etc. Check out their blog for photographs and detailed stories about various camping adventures—you’ll want to book a glamping vacation right away!